Michael Taylor has been gone from the Phillies organization since December, 2009, when he was included in a package of players that was sent to Toronto for ace hurler Roy Halladay. Taylor was quickly flipped to Oakland in a separate trade and has had a tough time reaching and staying in the big leagues ever since. The 6-foot-5-inch 255-pound outfielder has been mashing opposing pitching in the early going this season, to the tune of a .452 batting average, through 7 games with Triple-A Sacramento. 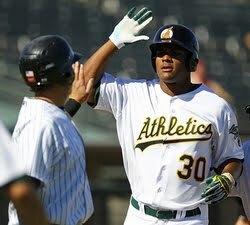 With 6 doubles, a homerun and a league leading 11 RBI, Taylor has helped lead the River Cats to a 6-1 record. Taylor, a Stanford graduate who spent this past off-season interning at a radio station in San Francisco, was the Phillies 5th round draft choice in 2007. Over the past two seasons in the Pacific Coast League, Taylor has batted .272 with 22 homers and 142 RBI in 220 games. The righty batting Taylor also sported a .200 average with 1 homerun and 1 RBI in 11 games with the Athletics last year. Now 26 years old, Taylor is at a crossroads. While he's steadily been on the brink of cracking the Major Leagues, he now sits on the verge of becoming a career minor leaguer. With the numbers he is producing thus far in 2012, that doesn't seem to be a likely option for the two-time minor league All-Star. In addition, Taylor's teammate outfielder Brandon Moss, who was a key contributor for the Lehigh Valley IronPigs club that went to the International League playoffs last year, is also dominating for the River Cats. In 5 games, Moss has posted a .421 average with a double, a triple, 2 homers and 6 RBI. Moss also appeared in 5 games for the big league Phillies last season, but signed with Oakland as a free agent following the 2011 season.